Two months after a rare Russian launch failure, an unmanned Progress cargo ship loaded with 2.9 tons of supplies and equipment bound for the International Space Station rocketed smoothly into orbit Sunday, clearing the way for the resumption of manned Soyuz flights next month, just in time for the lab's partners to avoid being forced to temporarily abandoning the complex. 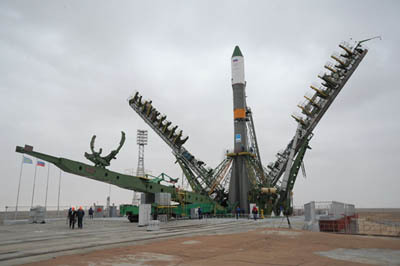 The Progress M-13M spacecraft took off from the Baikonur Cosmodrome in Kazakhstan at 6:11 a.m. EDT (GMT-4), kicking off the 45th unmanned Russian space station resupply mission. If all goes well, the Progress, loaded with 1,653 pounds of propellant, 110 pounds of oxygen, 926 pounds of water and 3,108 pounds of dry cargo, will complete an automated approach to the Pirs docking compartment at 7:42 a.m. Wednesday. "We congratulate our Russian colleagues on Sunday's successful launch of ISS Progress 45," Bill Gerstenmaier, NASA's director of space operations, said in a statement. "Pending the outcome of a series of flight readiness meetings in the coming weeks, this successful flight sets the stage for the next Soyuz launch, planned for mid-November." Anton Shkaplerov, Anatoly Ivanishin and NASA flight engineer Dan Burbank originally were scheduled for launch to the station aboard the Soyuz TMA-22 spacecraft on Sept. 22. But the flight was put on hold in the wake of a third stage failure Aug. 24 that prevented the Progress M-12M cargo ship from reaching orbit. The Progress Soyuz-U and the Soyuz-FG rocket used to launch manned missions use virtually identical third stages and Russian engineers immediately launched a failure investigation to figure out what went wrong and to make sure no similar problems could affect upcoming flights. Engineers eventually traced the Soyuz-U third stage engine failure to a kerosene fuel line blockage that disrupted the operation of a turbopump used to feed propellants to the main combustion chamber. Engines slated for use on upcoming missions were inspected and quality control was beefed up to prevent any similar problems down the road. But the failure and subsequent investigation threw a wrench into the space station's carefully choreographed crew rotation sequence. Since the departure of three crew members Sept. 16, the lab has been operated by a reduced crew of three -- Expedition 29 commander Mike Fossum, Japanese astronaut Satoshi Furukawa and cosmonaut Sergei Volkov. With Sunday's successful launching of the Progress M-14M supply ship, Russian space engineers are gearing up to launch the Soyuz TMA-22 crew at 11:14:05 p.m. Nov. 13. "To me, the Soyuz is like a sports car where the shuttle is like an 18 wheeler," Burbank, a shuttle veteran, said at a recent news conference in Moscow. "I'm very much looking forward to the ride uphill on the Soyuz ... and that hasn't changed a bit in light of recent events over the last couple of months." If all goes well, Burbank and company will dock at the upper Poisk module around 12:37 a.m. Nov. 16. The combined crews will have a brief, one-week handover before Volkov, Fossum and Furukawa undock from the Rassvet module and return to Earth aboard the Soyuz TMA-02M spacecraft on Nov. 21. Three fresh crew members -- Oleg Kononenko, European Space Agency astronaut Andre Kuipers and NASA flight engineer Donald Pettit -- hope to blast off aboard the Soyuz TMA-03M spacecraft at 8:16 a.m. on Dec. 21, three weeks later than planned. With their docking on Dec. 23, the station's crew will be back up to six.